10. Make sure the church pays him/her well. It’s hard to carry the cares of the church when one is wondering how to pay bills. 8. Instead of saying, “Good sermon, pastor,” point out a specific point that was helpful. Pastors get numb to that repeated phrase. 7. Say “Amen,” raise a hand, or simply nod your head when you agree with a sermon point. It’s hard to preach to an oil painting! 6. Send him/her an email of encouragement Monday. That’s the day most pastors consider resigning and putting on a Walmart vest. 5. Offer to babysit the pastor’s kiddos so the couple can have a date night. And provide the couple with a gift certificate to a restaurant—specifically, one without a drive-through. 3. Respect your pastor’s calling, education and experience. 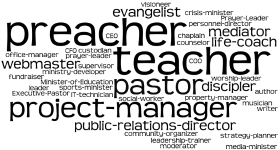 Too many laypeople believe they know more about running a church than the pastor. 2. Invite them out to lunch—without “something important to talk about.” Just listen to him/her. Be an encourager! 1. Pray. No one but a fellow pastor knows the pressure and temptation facing a pastor and his/her family. • Considering a post-clergy career? • Does God make “prank” calls? And if you appreciated this post, please share on my social networks. Thanks!